I’ll start it off! Pickapeppa Red Hot Sauce for me. The natural sweetness of cane sugar and fiery peppers is the perfect balance of heat and sweet. Goes great with everything. For me here in the UK, first place goes to Foo King Hot Reaper Madness. It is very hot but heat isn’t everything. This one has a pronounced coconut and mango flavour along with a hint of lime. I also enjoy Flying Goose Sriracha. If I had to stick to just one I’d bring lucky dog hot sauce red. Its been a couple years since I tried this sauce thanks to you Brian and it’s still one of my favorites. Cool! You’re welcome my friend. I love Louisiana Horseradish hot sauce. Perfect amount of spiciness and flavor for me. I use it on everything! That is a good one. The Louisiana Gold lineup is delicious. I am not really sure this is a fair question because I love so many hot sauces. But, I am a contest whore so I will say Secret Aardvark. I have a squeeze bottle of that around here… I should crack it open! I believe that “HELLFIRE FIRST BLOOD Hot Sauce” was one of my favorites. There’s no added extract or vinegar. It’s made with a variety of chilies and other fresh ingredients. Mine is Cholula. Its not too hot and has good flavor. I have tried many different hot sauces…but, my very favorite one is TEXAS PETE SRIRACHA CHA!!! That IS a great sauce. Sinclair’s Fatalii Hot Sauce by Sweet Heat Gourmet. its not very hot but man is it good. Thanks for the nice words, Travis! Shellie and her sauces are awesome! I wish it was still available, but I loved Hector’s Smokin’ Jalapeno and Smokin Habanero sauces. Good heat, great flavor. Tiger Sauce…I use it a lot while cooking on the smoker. It’s not hot but the flavor is great!!! Tiger Sauce really has it’s fans, huh? Mine would be Spice O’ Life Jalapeno Hot Sauce from of course…Cin Chili & Company. This sauce goes well on fish and anything green. On a deserted island your food choices are mostly seafood and plant life. Therefore, this is the perfect sauce to spice up your food options. Texas Pete’s for me. It’s so simple and a time honored classic. Professor Payneindass Sphincter Shrinker #2. My father in law opened my eyes to this delicacy. Happy festivities, friends! Another one I should try someday! Thanks Evan. 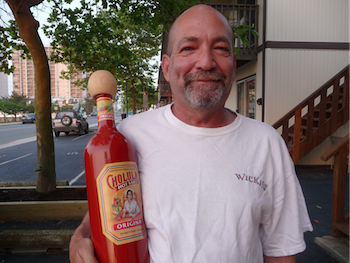 Great go-to sauce at hundreds of authentic Mexican restaurants… thanks Patman! And kudos for the í usage. Heh. Mine is a hot sauce two friends and I make each year. It uses the datil pepper, a great pepper that grows mainly in and around St Augustine Florida. Of course there are many companies here that brew it commercially, but we love doing it for family and friends. Last year’s was the best ever!. Very cool, Pennie… I love the Datil sauces. Dragon Fire from Island Spice. A friend of mine brought it back as a gift from Jamaica and I have been in love ever since. FIRE ANT JUICE!!!!!! There is no other choice…..
My desert island sauce would probably be El Yucateco XXXtra hot (habanero). It’s got a great flavor, and is hot enough that I probably would never completely acclimatize and get bored. Well if I could not have my home made hot sauce, (43 pepper sauce), then it would be cholula’s orignal. Please share a better link, I’d like to check you out. KYVAN® Original Hot Sauce for me. Great taste and full of flavor and the heat is not over the top. I love seeing the variety of choices! I’ve never heard of that one. Do you have a link? I have my go with anything sauce, but that’s not the answer to the question here. If I had to choose for a “stranded on a desert island” hot sauce, then I need to pick something that goes well with fish. My preferred hot sauce for fish is Blair’s Heat Jalapeno Tequila Hot Sauce. Spicy, with the tequila, garlic, vinegar, and lime required to go with the fish I’d catch on that island! Mine has to be “fiery Pineapple Spread” by Red Hawk Peppers! Fatalli peppers from So. Africa. LI have gone all the way to the Carolina Reaper and have a kitchen cabinet with three shelves of various hot sauces. It is hard to choose some times. Sitting inside watching the Blizzard of 2016, I will enjoy heating up later with something from my collection. Marie Sharp’s Hot Habenero Pepper Sauce for me. Great flavor, nice heat, and it being carrot based gives it a slightly different flavor, which I love. Great on everything. Lots of fans of Marie Sharps!